Read the dtcs by following the prompts on the intelligent tester. 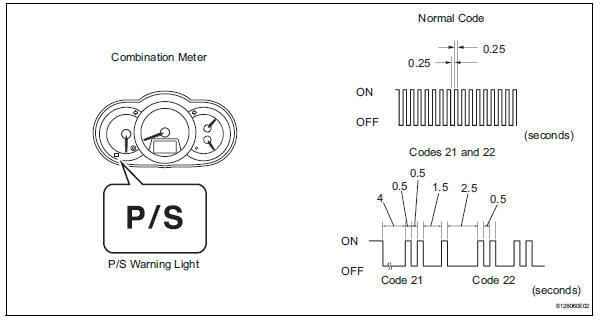 Read and write down any dtcs indicated by the p/s warning light on the combination meter. Refer to the chart below for examples of a normal code and dtcs 21 and 22. 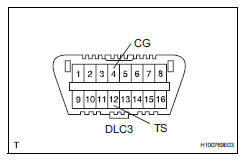 If the p/s warning light does not blink to display any dtcs set or the normal code, inspect the circuit shown in the table below. 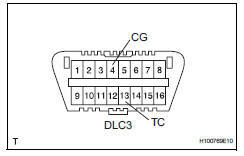 If two or more malfunctions are detected simultaneously, dtcs will be displayed in ascending numerical order. Refer to the diagnostic trouble code chart (see page ps-16) for dtc information. 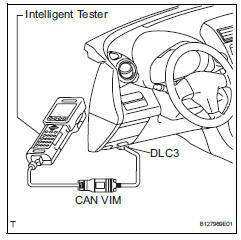 Clear the dtcs by following the prompts on the intelligent tester. Disconnect the intelligent tester from the dlc3. Disconnect the sst check wire from terminal 4 (cg) and reconnect it, and repeat this procedure 4 times or more within 8 seconds. Check that the p/s warning light blinking pattern is the normal code. Remove sst from the dlc3.